Screenshot, Vimeo‘Comanche,’ Jim Clark’s brand-new boat. The 70-year-old serial entrepreneur — who’s now worth $US1.4 billion after investments in Apple, Facebook, and Twitter — owns two massive super yachts that he uses to compete in long-distance races. However it’s his brand-new boat, named “Comanche,” that’s grabbed the attention of the yachting world. Comanche is a 100-foot monohull sailboat that can reach speeds of up to 40 mph. According to CNN, it took Clark’s team a year to finish it. The yacht will get its first chance with an upcoming race that takes competitors 630 nautical miles from Sydney, Australia to Hobart, the capital of Tasmania. It will be the first outing for Comanche. Comanche and its 22-person crew have already set sail for Australia, where they will prepare for the Hobart race, which usually starts just after Christmas. Clark’s other boat, the 295-foot “Athena,” is currently for sale for $US75 million. 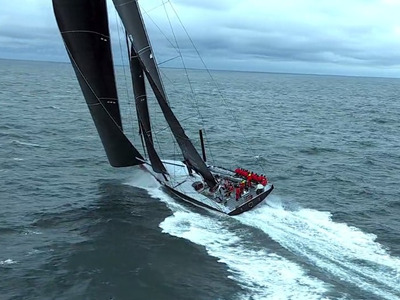 Check out this video that shows how fast Comanche can really go.